It is not easy to lose weight – all of us know this fact. Success can be achieved by following a tested protocol that helps you lose your unwanted pounds & understand how to maintain your desired weight. 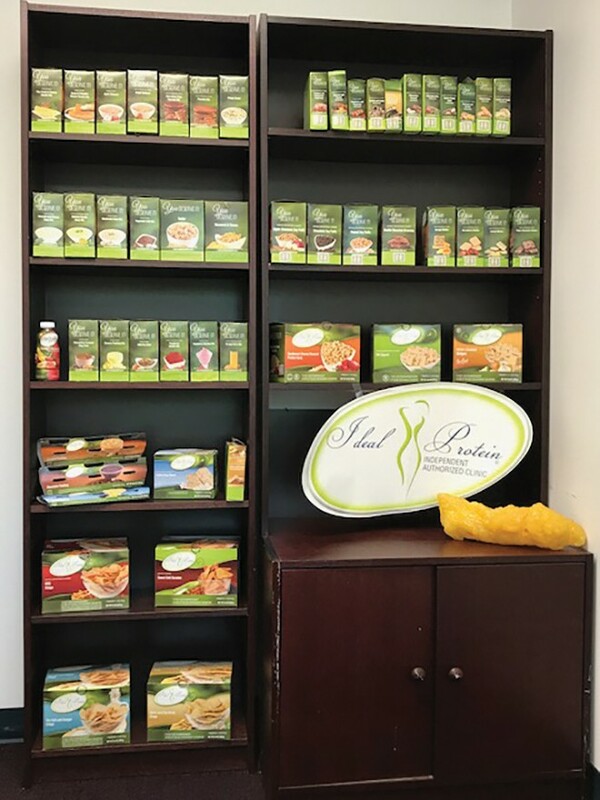 We invite you to visit our office and learn about a program that has literally helped tens of thousands of people lose weight successfully and just as important – keep it off. The program’s theories are not new; the diet uses foods made by Ideal ProteinTM but also incorporates real food right from the start. And after you lose the weight you and the doctor agree to—we continue to educate you on how you will reincorporate food back into your diet while maintaining the weight loss that you have accomplished. Weekly you are followed and your weight journey is documented. You and your weight loss counselor will discuss and choose your foods for the following week. There are supplements that are required because such rapid weight loss can deplete the body of essential nutrients. The obesity epidemic is one that we care about; however, this lifestyle food program can be used by people who want to lose 20 pounds or 100 pounds. Your health is important to us and so we watch your blood sugar and blood pressure as you participate in this program. Low carbohydrate diets are not new. The most famous low carbohydrate diet was written about by Dr. Adkins in the 1960s, but we do not advocate the amounts of fat that his diet suggests. Choosing the right foods to be successful at weight loss is challenging. When one limits the amount of carbohydrates in the diet it forces your body to metabolize fat instead of sugar for energy. This is known as ketosis. Less than 20-25 grams of net carbohydrates is necessary to achieve this body shift. It is truly likely that the consumption of refined grains, pastas, sweets and desserts, sugar laden drinks and similar high carbohydrate foods are what is making the people on this planet overweight and obese. So it is logical that if one can refrain from taking in these carbohydrates a more healthful state will be in one’s future. Indeed many people have more energy and stay lean on a ketogenic diet. But as the body goes from sugar burning to fat burning there is a transition phase which has been called the “low carb flu” because one’s physical and mental faculties are affected. Ketogenic diets have been hailed as curative of many ailments, but we are focusing on weight loss and a healthier way of life with less heart disease and less type 2 diabetes. Our own patients can attest to our success – we have seen diabetics lower and come off some of their medication over the course of their time with us. Actually long distance athletes perform better on a ketogenic diet. Just imagine, the body stores just 2000 spare calories of the carbohydrate glycogen but it can store up to 40,000 calories of fat; so fat is the preferred fuel for the marathon exerciser. Ideal ProteinTM offers a great balance of low carbohydrate, low fat and adequate protein choices. There are over 80 different kinds of foods: shakes, puddings, soups, chili, pancakes, chips, bars, and many other nutritious varieties of treats. All of this supervised by a physician and trained counselors to help guide your weight loss journey. It is not easy at first, but we have all tried the diet and understand how to help you through the change from sugar burner to fat burner. You will not believe the improved energy. It works if you work the diet. Lifestyle Wellness to improve the health and well-being of individuals in Delaware and the surrounding area. Please call us at 302-992-0200 ext.14 to set up an individual appointment. You can also pre-register for an upcoming informational session held the second Tuesday of each month beginning at 6pm at our location: 3105 Limestone Road Suite 300 Wilmington, Delaware.